The other day at the beach, I devoured Nina Simon’s new book: The Art of Relevance. 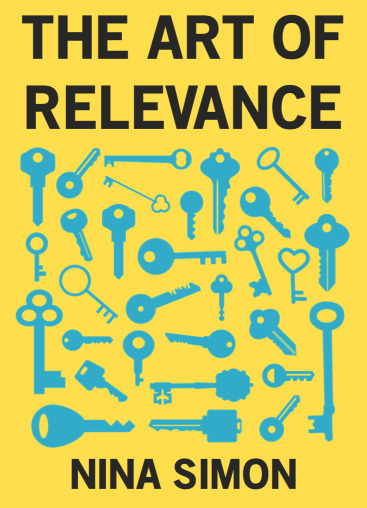 The website (where you can also buy it) offers this shorthand description: "The Art of Relevance explores how mission-driven organizations can matter more to more people." It’s an easy read with short, punchy chapters and Nina uses lots of storytelling, great examples to make her points. Not kidding—good beach read. This is an important book for •anyone• who is working in community development and community building. It’s especially great for anyone who works in a nonprofit or local government. It will make you think hard about whether you are focusing on the right things and people—once you decide what/who those are, and this book can help you do that. It’ll make you consider whether, despite a major investment, you can’t any longer justify continuing the bang-your-head-against-the-wall effort to start a conversation about relevance with organizational leaders. (Get over your cognitive dissonance.) Sometimes that’s just what has to happen so you can sleep at night, knowing that the way you invest your time at least seems to be paying off. As I read the book, I made notes in the margins—asking questions that I need to answer. And that I’d like for trustees and nonprofit leaders who are my partners to ask of themselves. And yes, I have a particular nonprofit arts organization that is on my mind these days. I’m struggling with participating on a board that feels like it needs to, but won’t, focus on the importance of relevance. I imagined sharing my questions with my fellow trustees. ● Do we all know and share the same understanding of our mission? What is it? What do we care about? ● Who is in our community? How do we define that community? ● Who do we want to engage? ● Are we opening the doors to people who don’t know us? Our community? The people we want to engage? ● Are we introducing the art to people who don’t know it? Are any of the people coming finding something new? Something they can’t find elsewhere already? ● Why are people coming? Do we know or are we guessing? Are we asking them? ● Are people returning? Why? Or why not? ● Who are our ‘outsiders’, the people helping us introduce the art to their community? Are they helping us make decisions? ● Do we all understand that donated money represents a public resource because the charitable deduction is revenue forgone for tax dollars that could support other public services? And that charitable dollars we use for our programming could be spent on other community goals? ● Do we agree on the value of spending public money this way? Is this the best way to spend scarce resources to achieve our goals, to reach and serve our identified community? ● Are we creating connection to our place? ● Are we offering something that is valued? Would anyone care if it went away? I rarely make recommendations like this. But there it is. Read the book. Find your questions. And then your answers. And if the book makes you decide to bail on something you can’t change and that’s not relevant: Score! That’s OK. You can now invest in creating or supporting something that matters more to more people of your community. What a great and thought-provoking framing and take on the book, Margy. --Where else could you apply the energy you are now devoting to this organization? --If you were evaluating an organization to get involved with, which of these questions would you most like to ask while vetting the opportunity to participate?